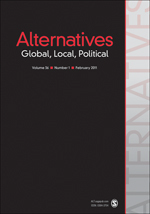 A peer-reviewed journal, Alternatives explores the possibilities of new forms of political practice and identity under increasingly global conditions. Specifically, the editors focus on the changing relationships between local political practices and identities and emerging forms of global economy, culture and polity. Published in association with the Center for the Study of Developing Societies.